In the center of the wrist, there is a space called the carpal tunnel where a major nerve (the median nerve) and nine tendons pass from the forearm into the hand. A very strong ligament forms a roof over the tunnel. When there is swelling in the carpal tunnel, pressure is put on the median nerve, which supplies most of the fingers and thumb with feeling and movement. When pressure becomes great enough to compress the nerve, Carpal Tunnel Syndrome may occur. These symptoms may occur by itself or in combination on either or both hands. Numbness or tingling is felt most often in the thumb, index, middle and ring fingers. The symptoms frequently occur at night. They may also be noticeable while performing daily activities like reading, driving, and doing household chores. A weakening of the grip may become apparent, along with a tendency to drop objects. Cut down on activities that cause continuous exertion or repetitive use of your hands, or keep the wrist in a neutral position may help reduce the swelling within the carpal tunnel and relieve pressure from the nerve area. Wearing wrist splints at night may relieve the symptoms and accommodate a better night's rest. Anti-inflammatory medication taken orally or injected into the carpal tunnel may help reduce the swelling and relieve symptoms. When symptoms are severe or do not improve with non-surgical treatments, surgery may be elected to enlarge the carpal tunnel by cutting (releasing) the ligament to allow more room for the median nerve. In this procedure, an incision made through layers of skin, fat, fascia, and muscle, to identify and divide the transverse carpal ligament. During traditional open surgery, the ligament is exposed through the palm and then cut by the surgeon. During small-incision ‘keyhole’ endoscopic surgery, the ligament is released without having to cut through the skin and muscles of the palm. Endoscopic surgery is now an alternative to traditional open carpal tunnel surgery. 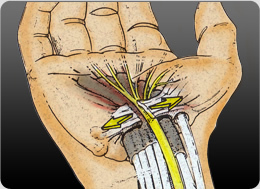 This procedure is performed using a device called the Carpal Tunnel Release System. It allows the release of the carpal ligament through a much smaller incision at the base of the wrist. A small endoscope and camera projects an “inside view” of the carpal tunnel onto a video monitor. The surgeon watches the screen and precisely cuts the ligament with a specially designed blade, simply by pulling a trigger. Both open and endoscopic surgery have the same goal - Dividing the transverse carpal ligament to enlarge the carpal tunnel, and relieve pressure on the median nerve. The endoscopic approach improves post-surgery comfort, and shortens recovery times, allowing faster return to normal activity. Dr. Jonathan Lee has been performing Carpal Tunnel Release using the ‘keyhole’ Endoscopic technique since 2002, shortening recovery times and improving post-operative comfort. Endoscopic surgery shortened the recovery period as compared to open surgery. While individual results vary, most patients return to normal daily activities within days after endoscopic surgery and return to work earlier than those who undergo the open surgery. Recovery of hand strength by open surgery can take weeks or even months while the palm heals.